Keen to capitalise on the shifts in investor sentiment and greater market awareness of sustainability issues, both old and new wealth management firms are touting their ability to build portfolios to match clients’ values. Most traditional, relationship based wealth managers specifically focus on ultra/high net worth individuals whilst others are using technology to reach the long-tail of the market. Further pushes to open up impact investing to retail investors come from people such as Big Issue Invest’s Chair Nigel Kershaw, in an effort to ‘democratise capital’. Whatever the client profile, the growth of the impact investing sector means a diverse impact portfolio can now be built across asset classes. Funds of ESG screened listed companies can be combined with private equity investments and sustainable bonds to create a tailored portfolio to match a specific individual’s risk/return/impact profile. The portfolio can also be steered towards certain impact objectives such as particular SDGs during the security selection process. As more impact investing financial products are launched in the market, impact measurement and reporting become clearer and a growing proportion of investors seek impact as well as returns this industry segment will grow substantially. Launched in 2016 and standing out as an impact-only wealth manager this firm offers discretionary and portfolio management services. Tribe was created in response to a significant increase in demand from individuals and charities wanting to achieve both sustainable impact and a financial return from their wealth. Early pioneers in sustainable investment funds and funds with an environmental aspect. The firm’s responsible wealth management brochure outlines the strategy. EQ Positive Impact Portfolios are a fully managed investment solution combining social and environmental impact with market leading returns. 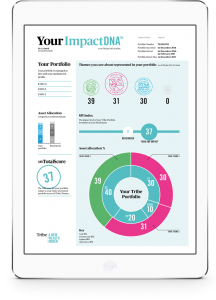 Portfolios are available in a range of risk profiles to suit different investor profiles. A pioneer of impact investing who has received awards for its innovations in ESG scoring framework with analysis of a company’s ‘consciousness, actions and results’ (CAR), the Global Climate Bond Fund, the Global Responsible Equity Strategy and the ground-breaking new humanitarian debt transaction with the International Committee of the Red Cross. In 2017, the world’s leading wealth manager pledged to invest $5B of clients’ assets into impact investments over the next five years. See the UBS Investor Watch, a survey of 5,300 investors in 10 markets on sustainable investing, for insights on the future of impact investing in wealth management. Barclays provide a range of options that are considered best in class for their consistent performance and integration of impact. For example the Multi-Impact Growth Fund is a multi-asset solution, encompassing institutional due diligence, strategic diversification, simplicity and daily liquidity. It gives access to impact managers and direct investments in a ready-made investment product that reports the impacts generated. See the firm’s paper “Investor motivations for impact: A behavioural examination” for interesting insights into investors’ views and behaviour around the field of impact investing.